Shoctopus is a collection of poems written by Australian author and poet Harry Laing. The book is quirky and fun and Laing isn't afraid to play with language. The book features an eclectic mix of topics; from funnel-web spiders to seasons to tyres, Laing embraces the freedom of language. I'm always a proponent of freeing yourself from the constraints of the rules and boundaries associated with language, especially when it comes to poetry and especially when it comes to children. 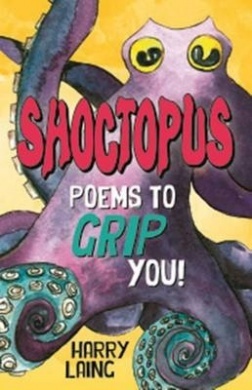 This sort of book is great for kids who are fans of poetry, but is also a sweet little nudge in the direction of poetry for those that don't. Actually, that's why I think books like Shoctopus are important. The emancipation from the obvious and expected can be a powerful tool for linguaphiles and linguaphobes alike. The book also features illustrations by Clinton De Vere.